In the long slew of Super Bowl ads aiming to break the monotony of the worst game ever, Hyundai’s “The Elevator” was kind of cute. Jason Bateman portrays a snarky elevator operator who welcomes aboard a couple who is about to buy a car. This effort will send them “all the way down” (to the lowest level of hell, apparently? 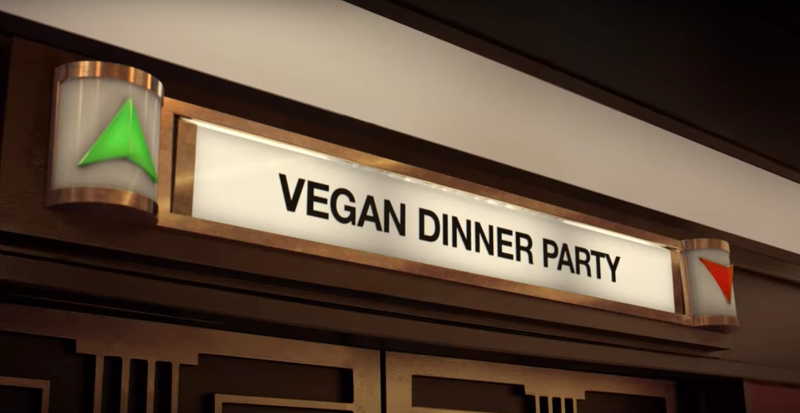 ), below floors like “Root Canal,” “Middle Seat,” and “Jury Duty.” Lower than even all of those was “Vegan Dinner Party,” (queries Bateman, “Is that even a thing?”) which offers a neon “beetloaf” as a main course, as the car-buying couple scurries back to the elevator for safety. Maybe it’s not about to win a Clio, but funny enough, right? Not if you’re the funny-bone-lacking organization PETA, which, as Uproxx reports, was quick to take offense at the ad. PETA called out Hyundai on where else, Twitter, suggesting Mercedes’ vegan Smartcar instead. To be fair, many experts have pointed to the vegan lifestyle as a potentially planet-saving measure (even Beyoncé endorses the lifestyle), so PETA’s not wrong to say that Hyundai’s vegan slam may be a tad outdated. On the other hand, the ad’s obviously a parody. Jason Bateman isn’t even a real elevator operator! We’re sure that PETA has bigger fish to fry. So to speak. And Hyundai has followed up the ad by saying that it’s actually trying to promote beetloaf. The presentation is certainly next-level.